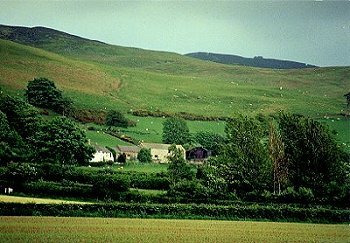 Landscape of dispersed upland farms and small irregular fields on lower slopes of Clwydian hills, approached by a network of twisting lanes and hollow-ways. On the eastern edge of the medieval parish of Llanfair, in the ancient commote of Dyffryn Clwyd. Lower slopes and stream valleys on western side of Clwydians hills, between a height of between about 100-260m, forming part of the Clwydian Range AONB. Dispersed farms, generally spaced about 400m apart, the higher ones being characteristically sited close to the upper margins of this character area, close to the former boundary of the unenclosed upland commons. The earliest surviving buildings are 18th-century slate-roofed farmhouses of slate or shale, sometimes rendered, and contemporary stone barns. 19th-century outbuildings are frequently in brick, with occasional new replacement farmhouses also in brick. These farms probably represent an earlier phase of enclosure of the lower hill and valley land probably dating the later medieval and early post-medieval periods. Enclosure is represented by relatively small and irregular fields defined by well-maintained multiple-species hedges of oak, hazel, ash, blackthorn and holly, with post and wire repairs and occasional drystone roadside walls near farm entrances and occasional stone gate-posts along roadsides. Some grown out hedges with spaced lines of trees and shrubs. Slight lynchets have formed along field boundaries in places. In places, as around Bryn Isaf, several smaller fields have been amalgamated into a single larger rectangular fields, now fenced with post and wire, with traces of earlier boundaries and lynchets visible as earthworks in places where former hedges have been grubbed out. Taller trees and shrubs, principally alder and ash, in spinnies at heads of valleys and running down steep-sided streams. The narrow, twisting lanes which link the farms with the outside world often take the form of hollow-ways which have been worn into the hillside, the sides of some of the hollow-ways having been revetted in stone to inhibit further erosion. Roadside hedges are characteristically of holly, possibly due to the selective removal of other species more suited to working or for fuel rather than deliberate planting.